Ahoy from the other side of the pond! I made it here all in one (sleepy) piece, including all my luggage. My flights were easy and somewhat boring – Icelandair is not a fan of free things and hence only had paid food both times, though I was riding for more than 8 hours. (A little rude if you ask me!) Here’s hoping that Turkish Airlines has a better deal on the way home, but I’m not really worried about that yet. Mostly because I’m having a BLAST here. 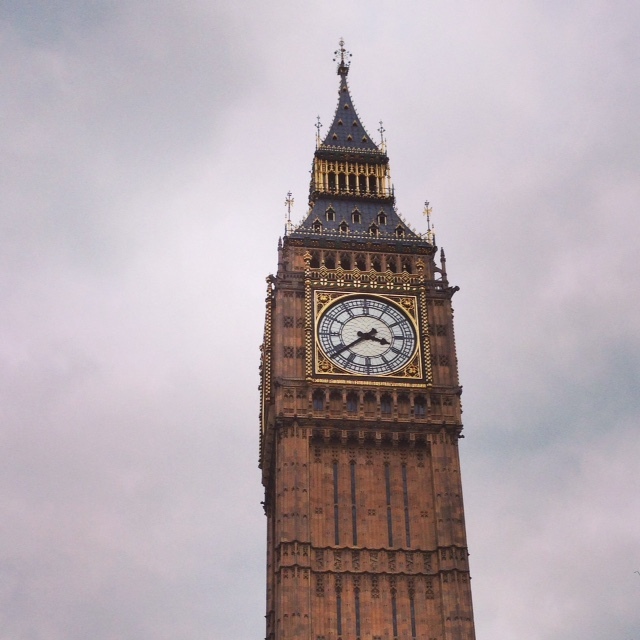 In the second half of day one, I unpacked every so slightly, then decided to prove to myself that I was really here by seeing a local (no, national… no, international) landmark with my two eyes, so I walked all the way to Big Ben. It was even better than I remembered – this tower is quickly becoming my favorite thing in the city, now that I’ve seen it in all weather (helloooo London fall!). Today, I did even more. 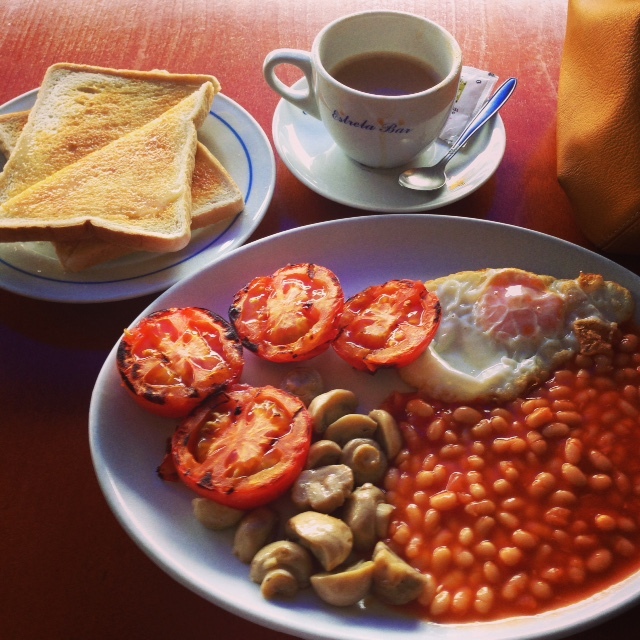 I started my day with the local tapas bar’s version of a vegetarian English breakfast – all for £4.10, including the coffee (and the required British side dish of secondhand smoke – coughcoughcough). Still, it was delicious, though I don’t think I need to eat mushrooms for breakfast every single day. Then I walked around my ‘hood a bit to see what was up. I discovered that Oval “park” is a cricket pitch, not a place I can sit and read a book. Good thing there are enough other places that meet that criteria! In the afternoon, I explored Covent Garden, Charing Cross, etc. taking in the sights and trying to stay out of the rain when possible. No matter where I went, it was just so good to be back in this weird and wonderful land. And then the ride home was incredible, as it took me past Big Ben. 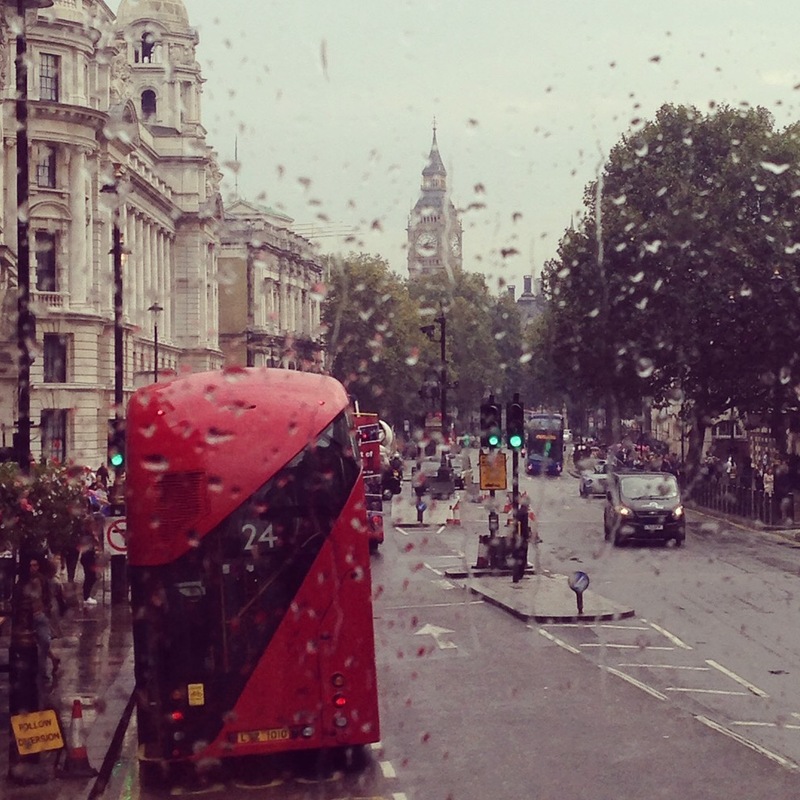 I don’t know if I’ll ever take the Underground if I can help it, the bus is so great! Finally, because it was Mountain Day, I met up with some MoHos for ice cream and college reminiscing. Perfection! Not walking too much – I logged 16,000 steps today aka 7.5 miles! Great, but also could be extremely exhausting on days when I actually have to do something, so I need to find some activities that don’t all involve walking or standing. Remembering to eat – I got so excited today that I kind of forgot to eat for way too long, which doesn’t go well with #1 and resulted in getting a bit lost. Snacks all the way, and just generally eating good food when I find it. Not spending all my money – I WANT EVERYTHING! Seriously, everything. I didn’t even stop walking at Jubilee Hall because I knew if I did, I would spend all my money. I have a while to be here, so I have to remember to pace myself. Not getting hit by a car – this one is non-negotiable, and it’s slowing me down but I’m never crossing without a light because the traffic here is making my head spin. Sidewalk – sorry, pavement – traffic is rough enough, but the streets are out of control. I saw a grown man almost get hit by a bus but his friends pulled him out of the way by his backpack just in time. Not I – I would rather be the silly person waiting at every light while others run just to be on the safe side (literally). I think if I can do those four things (and maybe also remember to sleep), this adventure will be top notch. It’s certainly off to a smashing start! Stay tuned for a few more updates this week! Today is my favorite holiday – Mountain Day. At my alma mater of Mount Holyoke College in western Massachusetts, Mountain Day starts on a random weekday morning in the fall when the bells in the clock tower ring incessantly. This deafening toll means that you are excused from classes, meetings, and responsibilities for the entire day. People either sleep, study (even though, for once, it’s discouraged), or trek up the mountain. Too lazy to climb the 940 feet? A shuttle will take you to the top, where the MHC President dishes out ice cream for lunch. I loved Mountain Day so much, I turned it into a monthly tradition. Usually, I hiked with my roommate Julia and made a point of going every month we were at school – sometimes, that meant hiking at 5:00 on a December morning, sometimes we caught the last rays of light in April. I roped other people into it as our schedules got harder to manage, and kept up the tradition my entire MHC career. At the end of it all, I delivered this speech at commencement about how our college experiences, and our lives, resemble the waiting and the possibilities of Mountain Day. Happy Mountain Day, fellow MoHos. Hike that mountain for me! Want to know more? Read my Mountain Day post from last year!